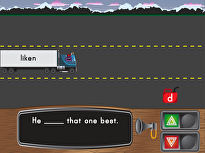 Help your child build his grammar skills with a punctuation worksheet. He'll have to add in the missing punctuation marks, which will give him great practise using commas in a list. Using commas correctly is a tricky skill to learn. Give your child the extra practise she needs with this punctuation worksheet. Get your child's punctuation engines started with this worksheet that breaks down where and how to use commas. 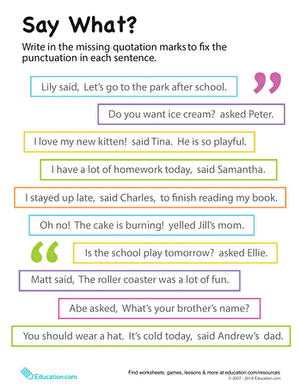 Kids practise using quotation marks correctly and identifying words that should be capitalized in this grammar and punctuation worksheet. Inspire your child to practise using commas accurately with a punctuation worksheet that has a spooky twist. Practise correct placement of commas and semicolons in sentences. 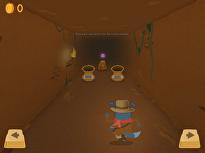 In this summer story, your student will need to add a comma to sentences when necessary. 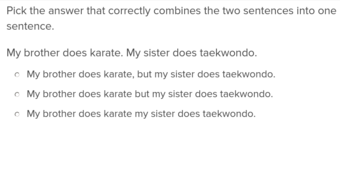 This worksheet is a grammar review on the three uses for commas. Get into grammar Halloween-style with a creepy comma worksheet! Your student will add missing commas to the sentences, making the writing easier to follow.